Wishing you all a very happy ganesh chavithi! Today our 35 months old son was excited as it was “Om deva’s” (God) birthday. Together we plucked flowers from our garden and decorated the pooja cabinet with flowers and lights. 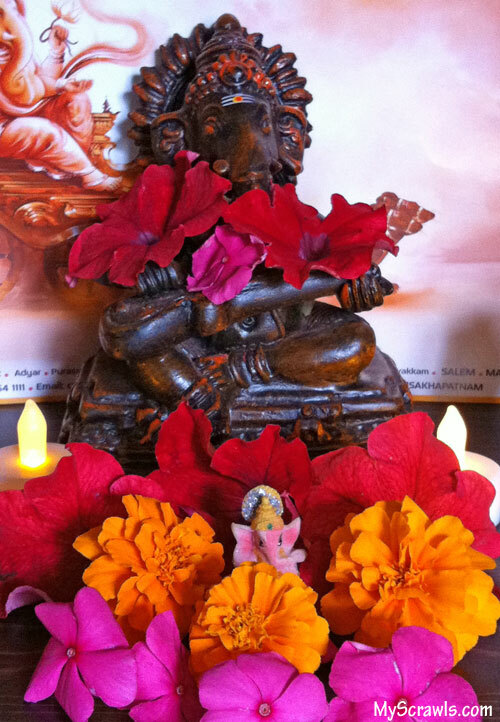 Skandha sang the famous tamil song “vinayakane vinay theerpavane”, few ganesh slokas and the happy birthday song. I’m sure lord ganesh was truly pleased Hope this vinakaya chathurthi brings loads of happiness and prosperity!!! Nice singing Skandhu; excellent voice. After along time i have learnt how to prepare Modakams. Let me try this for this Sathurthi and ill tell. Thanks Latha. Hope u enjoyed the recipe.